Youth Advisory Members distributed the surveys on the early morning water taxi. SWOVA’s Salish Sea Girls’ Leadership Project (SSGLP) is paving the way for young women to share their voices. Over the spring and summer, we carried out a Needs Assessment Survey asking young women about the issues they face living in the Gulf Islands. We received a fantastic response; 17% of all the Gulf Islands women aged 15-24 completed our survey, giving us a great representation of this group. The young women who participated went above and beyond in their engagement with the survey material, seizing the opportunity to share their thoughts. Many responded with plenty of detail to the survey’s open-ended questions, giving thoughtful commentary and great suggestions for change. Some told very personal stories about their struggles with the issues the survey brought up, from body image to bullying. A strength of this project is the instrumental role the young women on the SSGLP’s Youth Advisory Council had in creating this survey. Rather than being a process external to the lives of young women in our community, administered to youth by adults, the YAC girls designed the survey, created its questions and worked hard to distribute it and gather responses. 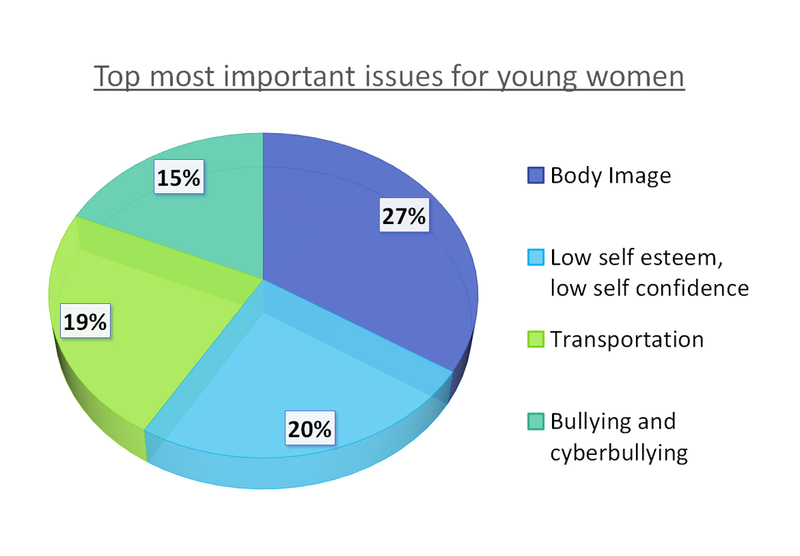 In one part of the survey, participants were asked to list what they thought were the most important issues facing girls and young women living in the Gulf Islands today. It was eye-opening and saddening to see the prevalence of body image concerns. A host of related challenges to girls’ well-being came up as well, including self-confidence, peer pressure, depression and sexual health. Youth do not feel their transportation needs are being met; although they appreciate and use Salt Spring’s public bus system. It remains difficult for them to get home safely late at night or access activities and jobs at convenient times. Other major issues included: bullying and cyber-bullying in particular; the prominent “party culture” and drug and alcohol use among youth (in part a result of the lack of alternative activities available for youth at night or on weekends); and a lack of quality spaces to get together and talk. Research says that this is one of the most important supports for fostering girls’ leadership. On a brighter note, young women also listed the best things about living in the Gulf Islands. Over eighty percent of the survey participants described the overall positive atmosphere our communities provide. Safe, caring, supportive and accepting were just a few of the most common terms used. The high school also embodied this caring environment. It was thrilling to see so many responses about the impact SWOVA’s programs, like Respectful Relationships and Pass It On, have had on youth’s experiences. Also ranking high were the rich natural environment and the existing activities, from sports and arts to peer mentoring, that youth can get involved in. With our survey period over, we have read the insightful responses, analyzed them to produce some fascinating results – but the action does not stop there. Our next steps are to meet and discuss the issues with community stakeholders and the members of SSGLP’s Youth Advisory Council. We hope that our community’s open and supportive nature, which was acknowledged by so many survey participants, will help us make strides towards our goals. We will develop feasible ways to take action on these issues and enrich the experiences of our islands’ youth!